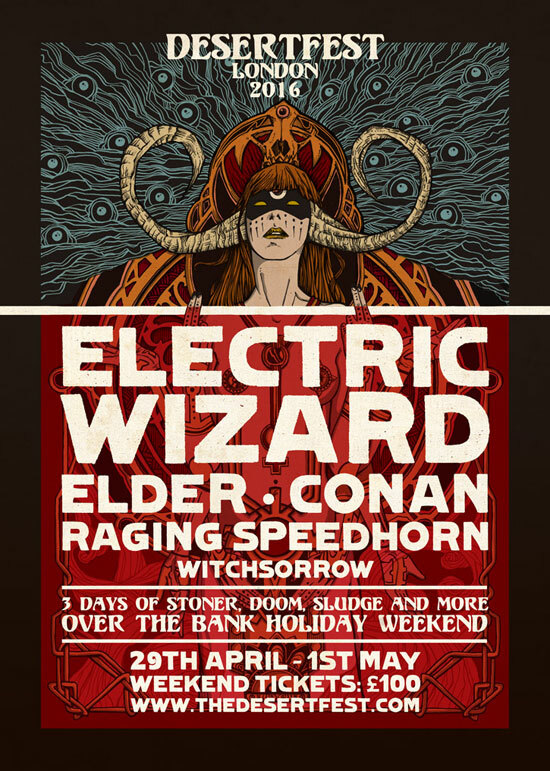 It really doesn’t seem that long ago when we were walking the streets of Camden taking in the sights and sounds of Desertfest London 2015, but here we are in September 2015 and not only have the first batch of bands already been confirmed for the fifth edition of Desertfest London, weekend tickets are also now available! Leading off the announcements were UK doomers WITCHSORROW, with the imminent release of their third album No Light, Only Fire, this 3 piece will be sure to bring the doom and gloom to the streets of old Camden Town. This was swiftly followed by announcing the first of three headliners, genre-defining doom titans ELECTRIC WIZARD who’ll make their first appearance at Desrtfest London and unleash an aura of devastating doom drenched misery over at the Koko on Sunday 1st May. The Desertfest London crew certainly know what’s best in life and with the announcement of CONAN making a welcome return to Camden, we can’t argue with that! The trio are currently recording their new album and we think it’s safe to say foundations will crumble that night. With a heralded reunion last year, along with their subsequent laying to waste of Damnation Festival in Leeds, RAGING SPEEDHORN will be dishing out the filthy sludge, aided and abetted by their savage twin vocal attack, expect the pit to erupt! And last, but by no means least, the sonic meanderings of ELDER, hailing from Boston in the USA, their subtle take on the stoner blueprint will see you join them for a kaleidoscopic journey, drifting its way through hints of prog, kraut, psyche and classic rock, a welcome come down after the devastation that has gone before. Desrtfest London takes place over the weekend of the 29th April – 1st May 2016 across 5 venues in Camden Town, London and weekend tickets, priced at £100 (+ booking fee) are available to purchase online now from Leeds Tickets. Hotel packages will also be available over the coming weeks, details will be announced very soon.